GSM Elderly Care Alarm System is a newly released smart solution for taking care of senior, aged, elder or disabled people in their daily life. SOS 100 helps users to know if there have fallen down, SOS emergency alarm from families, smoke, gas, water leakage alarm of the house, indoor temperature value, or if elderly didn’t get up on time by SMS text. 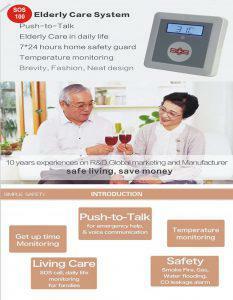 Senior Helpers device provides quality Home Health security real-time. Big LCD display temperature and time, easy setting by smart phone APP and installed for house, helps users to know if there have fall down incident, SOS emergency alarm from families, smoke, gas, water leakage alarm of the house, indoor temperature value, or if elderly didn’t get up on time by SMS text. Nowa days, the aging trend is very serious in all countries, and lots of seniors living alone, well used for take care of families by the advanced and reliable technology. 1) GSM Quad-band frequency: 850/900/1800/1900MHz. 2) Inbuilt temperature monitoring alarm. 3) High quality 2 way voice talk, audio volume adjustable. 4) Auto answer phone call from White List. 5) AC/DC power goes ON/OFF alert by SMS. 6) Rechargeable backup battery. AC/DC power ON/OFF alert by SMS. 7) Inbuilt temperature monitoring alarm. 8) Easy for use: Push SOS button to talk. 9) Easy installation: Wall mount or put on the desk. 10) Easy operation: Smart phone APP on Google Play or SMS commands. Click Here to download the user manual in English.